Every year we hold at least one corn tour during the first or second week of September. Please check back for confirmed dates. Every year we hold at least one canola tour during the first week of August. Please check back for confirmed dates. We run 2 types of plots in order to gather data, including Product Advancement Trials (PAT), which we use to accrue data on experimental varieties. So that we have information to share with producers regarding an experimental variety that has been registered. The second plot type that we utilize is the Product Knowledge Plot (PKP), which we use to gather knowledge about registered varieties. We also try to line up many side-by-side (SxS) plots in order to compare products and agronomy. Field-scale program that generates yield performance data used to make product advancement decisions. Replicated trials conducted under a wide range of environments and management practices. Used to allow farmers to be the first to test and trial new commercial products. Used to test new commercial products under many environmental and management conditions. Used to gain experience with new products before wide-scale launch. Field scale demonstration of commercial products that are managed with farm scale equipment. Customer can “test drive” Pioneer genetics against other products on their farms. Allows “system comparisons” to measure overall performance of hybrid and weed control. The Proving Ground™ trials encompass our complete testing program – from research through testing both products and agronomic practices that make a difference on the grower’s operation. They truly are where research meets reality. 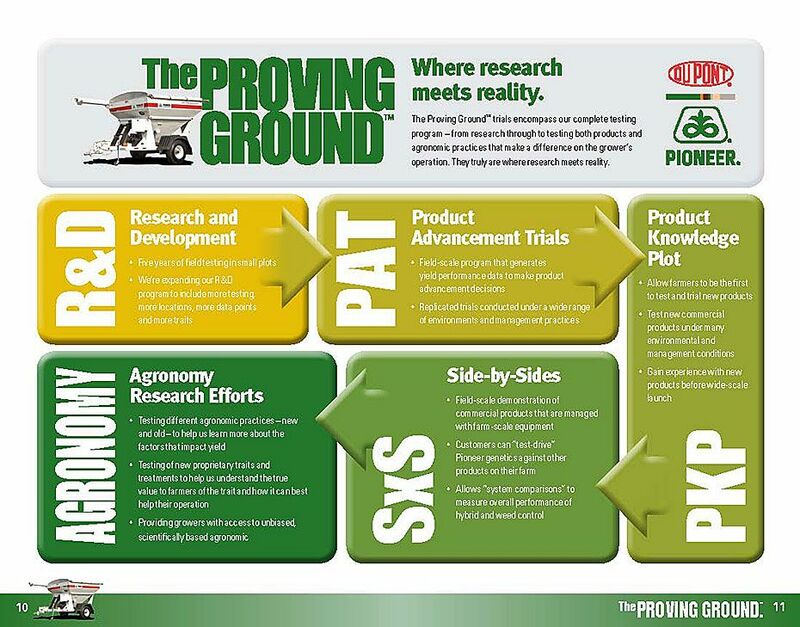 Take a look at the DuPont Pioneer Proving Ground information. If you have a growing interest in canola or corn, we can give you an impromptu tour.